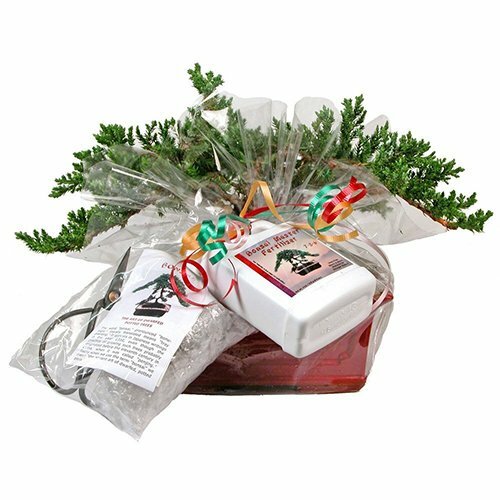 Small 6 year old Japanese Juniper Bonsai Gift Kit with Gift Wrap, Clippers, Fertilizer, and Figurine. Planted in an 6″ ceramic container. 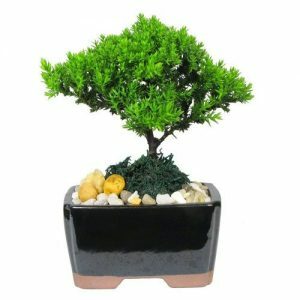 Bonsai Tree averages 8-10 inches tall with 6-8 inch spread. Gift Kit includes Gift Wrap, Clippers, Fertilizer, and Figurine. Bonsai Trees thrive for years with proper care. Most important is bright light and consistent watering. Most bonsai prefer the outdoors with fresh air, light, and water and do best on a covered patio with filtered sunlight or outside under a shade tree. If you want to bring your bonsai inside, it should be only for a few days, then place it back outside for fresh air and natural light. There is a distinct balance between the amount of light a bonsai requires and the amount of water it requires. The more light a bonsai gets, the more water it needs. The less light, the less water. Depending on the amount of light and temperature of your environment, this may mean watering your tree to saturation daily. NEVER allow the soil to dry out. You will also want to spray or mist the foliage as often as possible. 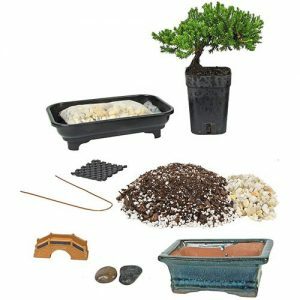 If using a tray under your bonsai, make sure the tree does not sit in water by using pebbles on the tray to keep the pot above the water level. 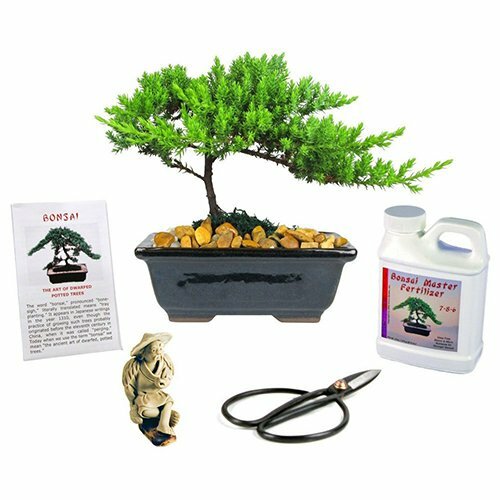 Most bonsai can withstand temperatures below freezing; however, we recommend that they be brought inside during severely cold weather and kept in a room near a window with good bright light. Bonsai should be transplanted when the roots begin growing out the sides of the container. 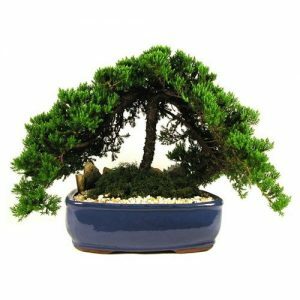 For most bonsai, this occurs about every two to three years. It is best to repot in the Spring and yearly new rich soil should be added to your tree. 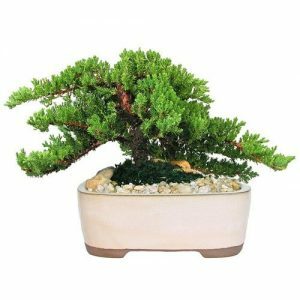 Use a good fertilizer designed for Bonsai. Eve’s Garden has designed Bonsai Master Fertilizer, a mild 7-8-6 formula with everything you need to make your bonsai thrive. Fertilize March to October and be careful not to over fertilize. Always follow the directions on the label of the fertilizer you are using! Pruning and trimming can be performed on your tree throughout the year. In the case of deciduous trees, such as maples and elms, pruning and trimming is best performed during the growing season. Juniper, pines, and cypress are finger-nipped throughout the growing season to keep the tree shaped. Trimming the under and inner growth is needed monthly.